Speaking about engagement and possible photo shooting that can be a part of the whole wedding event, I should say that for any couple it is a perfect way to test each other in front of the camera on the one hand and on the other — a story of love told in beautiful pictures will be the best present from the brides to friends and relatives invited to the ceremony and wedding dinner. Therefore when I receive requests with inquire for a big day photo shooting, I try to encourage my clients to have a pre-wedding session as well. Below I will suggest some variants of how and where to plan your engagement and how to be a success in finding the best location and of course how to choose a proper engagement photographer. Let’s begin! My professional experience in pre-wedding photography is more than 6 years. I’ve been working with couples from absolutely different cultures and countries. About almost every couple I have a story in pictures on this web-site. Therefore I decided to build certain structure of the knowledge I posses and to share it with you. Hopefully my observations and conclusions will encourage more and more couples to have and to plan an engagement photo shooting. One of my favourite kinds of engagement is a surprising one. You know why? Because if it is really unexpected step from him to her, she is sure to be socked, astonished, smashed and crying. 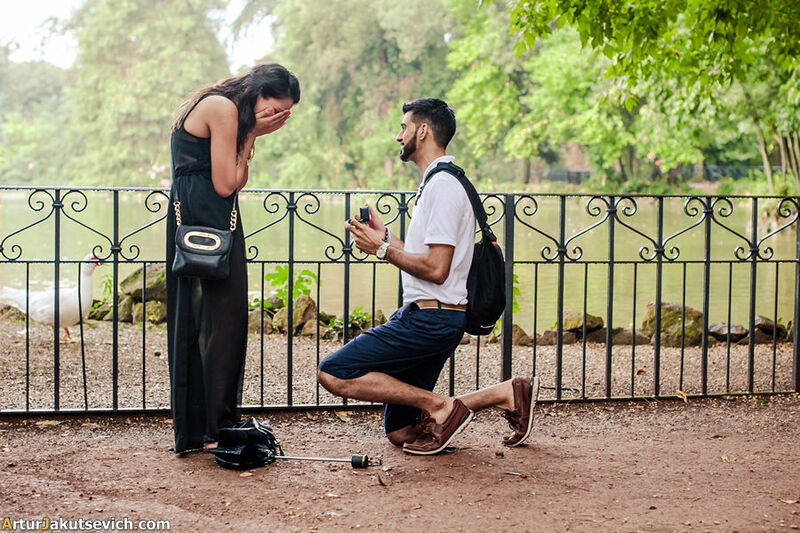 Believe me, the emotions that girls experience at the very moment when he asks “Will you?” are priceless. Among the brightest examples is my american couple Ricky and Pallavi. They got engaged in Rome in Villa Borghese after a heavy rain. For Pallavi the ring and the question were a surprise and of course she didn’t know about me being a professional Italian photographer. Another variant of how to get engaged is to book the flight and to travel together. 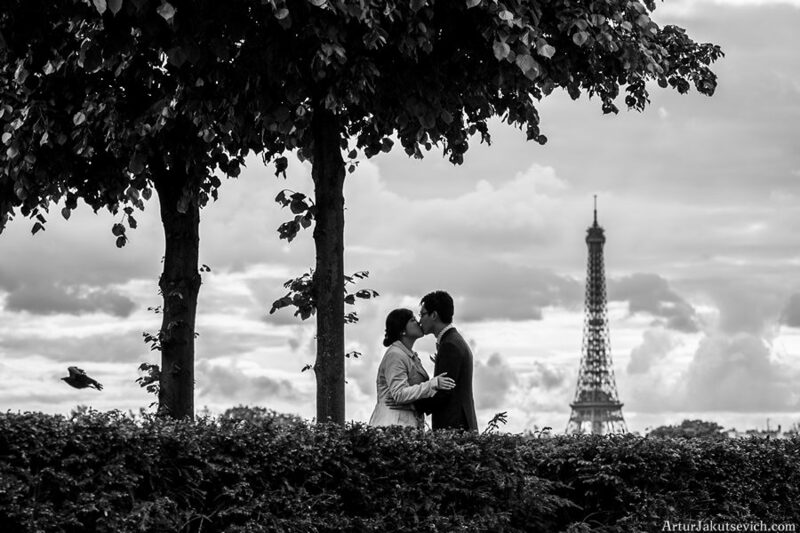 Among all popular locations in the world, the first winning destination were thousands of men pop the question to their beloved women, is Paris. No doubt that due to books and movies about this gorgeous city, people go mad about planning either a photo shooting in French capital or even a wedding. On of my first couples who I worked with in Pars, were Alvin and Tong Tong. Originally they come from Singapore and France was one of the countries for a pre-wedding and engagement trip. Since they are quite calm and romantic people, we decided to plan thoroughly the rout of the photo shooting and just to enjoy to best parts of the day: early morning and late evening. Some of the couples are ready for experiments and inventions. They do feel comfortable in front of the camera wearing interesting costumes and playing certain roles, which we always work out in advance. 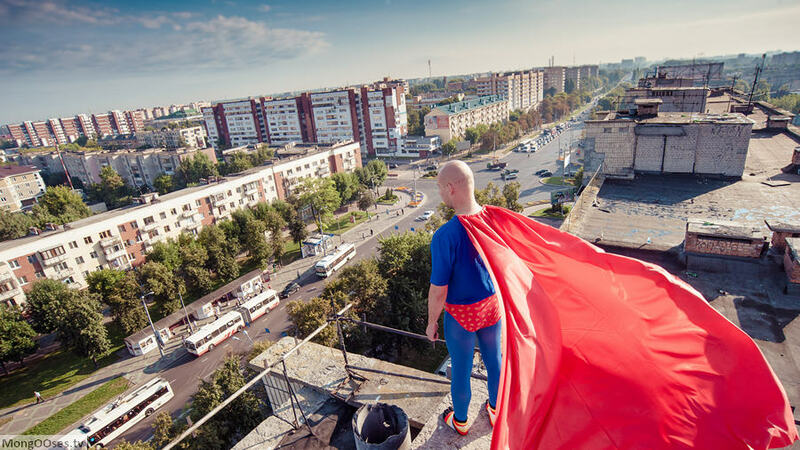 With Aliona and Vadim we created together an amazing pre-wedding story about Superman. That engagement photo shooting was shown at the wedding reception and all the guests were super surprised and happy to see their friends in new looks. By the way this love story is absolutely true, since the Vadim is a fireman and he really rescues people’s lives. So as you see the first idea is on the surface. Some people after certain time spent together not only fit each other, but even look quite the same. I’m sure you understand what I mean. Among such couples there is the one I got to know in Prague. It was a coincidence that we meet with Anna and Rene, but that turn of life was a very interesting. So after some time spent together while discussing the plan for the engagement photo shooting we came to conclusion, that both of them simply like to walk and enjoy the city and each other. So, that was already our plan. As a result I’m happy to share on of the most beautiful pre-wedding photo shootings in spring in Prague. One more variant of having interesting engagement photo shooting is to find a photographer and pan a night shooting. That what we did with my another couple from Singapore in Prague. Lijie and Weizhang after meeting each other and falling in love became addicted to traveling. Since Singapore quite a modern city with absolutely no historical buildings and landscapes, they started to look for something special in Europe. Once Lijie found photos if night Prague and since then it was her dream to come to Czech Republic. So they got engaged and had a amazing night photo shooting. Engagement photo shooting is also nice option to try on a dress and suit before wearing wedding gown. Almost all the couples are afraid of camera and they are sure to look awkward in front of the camera. This what hear in 99% of all conversations prior the shootings. Practice makes perfect some said and I fully agree. There is no other way to feel confident in yourself, but to go for a shooting. Situation like that I can remember from a shooting with Elena and Roman. If she was ready and prepared to work with photographer, Roman was quite confused. But as a result of our communication and planning this engagement story from Rome turned to be really nice. 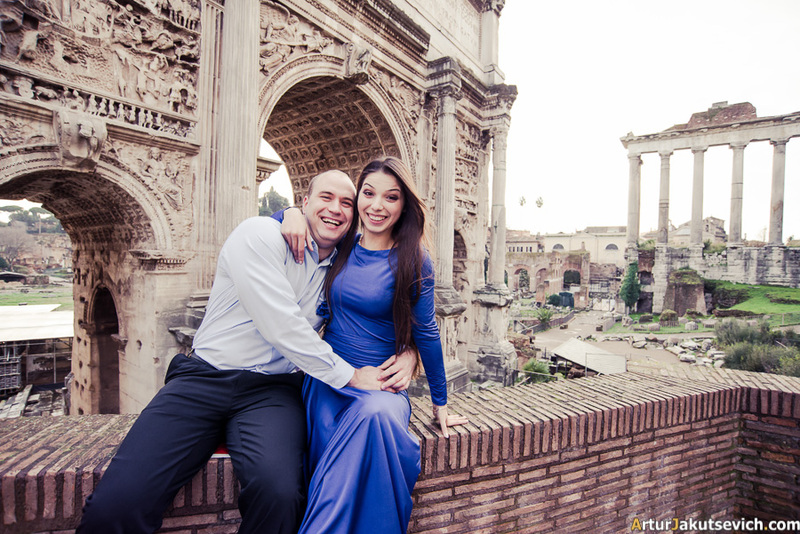 I met Anastasia and Sergey in Rome after they already saw lots of locations and were completely inspired with the beauty of the city. It was their first pre-wedding trip to Italy and Anastasia was keen on the thought of having an engagement photo shooting with Italian photographer. So after our meeting I realised that the couple is quite extraordinary and I had to offer something special for them. 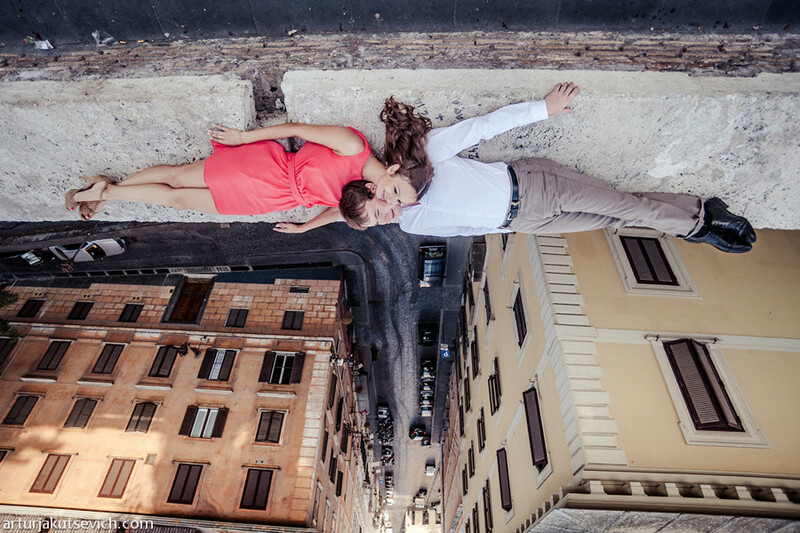 The idea of a pre-wedding photo shooting was a bit crazy and even a bit thrilling. Sometimes the ideas which become the backbone of the pre-wedding story turn out only during the shooting itself. Let’s get back to unique and so divers place of Rome as Villa Borghese, where one is sure to find inspiration and unique ambiance. When we were finish the engagement photo shooting with Wendy and Alex they saw a boat and asked if it was possible to have a little trip on it. Of course it was possible and it was beautiful. These are just several ideas and examples of pre-wedding and engagement photo shooting in different cities. I will do my best to keep this page updated with new photos and new couples. Get inspired!